What is PMI Testing? Positive Material Identification (PMI) testing is analysing materials to work out the chemical composition of a metal or alloy during different stages of alloy manufacturing or alloy installation. Materials are graded according to UNS and ASME material codes. PMI enables the material grade of a component to be determined. It is one of the more specialised methods of Non-Destructive Testing. Discovering exactly how a material is composed and the grade of an alloy will help suppliers and plant workers to match alloy specifications, chosen for the specific properties they have. For instance, heat resistance, corrosion resistance and durability. Why is the right alloy needed? The right alloy with the right properties can create a ‘make or break’ situation in terms of having a safe working operation or creating a hazardous one, which results in loss of time and loss of income. Using the right alloy is essential in working environments such as chemical plants or petroleum refineries. These days, many manufacturers of alloy use advanced technology to analyse the different grades of stainless steel available. Stainless steel grades differ depending on their chemical composition. Some grades have different properties, but the key difference between them is mainly the amount of Copper, Chromium, Iron, Nickel and Molybdenum contained within. To give an example, Stainless Steel in 300 series is magnetic, but Stainless Steel in 400 series is not and it is all down to the different percentages of the main constituent components contained within the metal. Currently most alloy manufacturers, petroleum refineries, and other businesses responsible for alloy grade verification use technology to quickly and easily separate various grades of stainless steel. 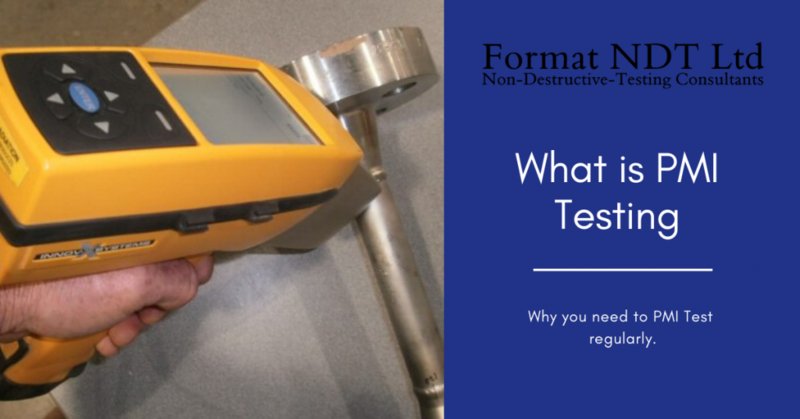 The most common tool for this purpose, and the one Materials Inspectors at Format NDT use is an XRF (x-ray fluorescence) analyser when carrying out an NDT inspection. This tester is accurate in determining the chemical makeup of alloys, and from this, working out their grade. They can do this within a matter of a few seconds, without the need to prepare samples. There is a danger in analysing materials that are being used as part of a process, and therefore any instruments that are used to test need to be non-destructive. This testing qualifies the analysis as non-destructive testing as part of an NDT service. PMI testing will establish whether a material has been altered in any way and whether it is in the same condition as it was prior to being tested. There must be no marks or structural change left from the analysis. Even if a material has an authentication mark such as a mill stamp on it, to show its provenance PMI still needs to be performed to make sure it is safe to use. This is necessary as a safety precaution, as mishaps can occur. Materials can sometimes be wrongly graded, mixed up, or the paperwork for them be lost or damaged. These factors are rarely done on purpose, but it does mean regular PMI testing needs to happen to be assured of complete safety. Every refinery or chemical plant must have a PMI Testing plan in place. Mix ups with materials can occur at any stage of the industrial process whether it is from the alloy fabricator to the installation of a part at the refinery or chemical plant. Every component and alloy must be checked at different stages of the process. This should begin at the incoming materials warehouse as part of a PMI spot check. A material verification programme should also be put into place as well, to provide results and documentation to prove what materials were tested and what the results of each individual test were. In the past, chemical plant and petroleum refinery operators have relied on certification to show how a material is composed or used material test reports that have been sent from suppliers. Over the years it has been found that these methods are not one hundred percent reliable. There is always the possibility that reports are not accurate at all, or that the wrong certificate is put with the wrong material, or that certificates are separated from the materials to which they belong. PMI Testing should be performed again when new components have been installed. Every part that is installed in a refinery or chemical plant that is in a high-heat, pressure or corrosive space should meet the specifications that are needed to match the demands of the environment they are in. If there is a concern that there has been a material mix-up during previous on or off-site maintenance activities. If there is a real concern that there has been a piping or component failure as a result of non-testing in the past. Consideration needs to be given as to how close components and piping are to other equipment and whether it will affect those. Consideration must also be given as to how materials may affect human life and if there is any danger present. Have the components always been kept at the right temperature and at the right pressure? Is there any previous knowledge or understanding as to what has happened if/when components have failed on site? Is there knowledge of the materials that gaskets are made from? Is there knowledge of susceptibility of materials to sulfidation? Have there always been proper maintenance practises in place? How can Format NDT Help you? PMI Testing is the answer to making sure there is a safe environment to work in for chemical plant and refinery workers, but also to make sure that projects are completed efficiently effectively and with little or no down time which can cost time and money. If you’re still unsure about PMI Testing or have any questions at all about the processes we use at Format NDT, contact us today to find out How we can help. PreviousWhat is Non Destructive Testing?